It’s almost that time of year again! August 11th marks the 4th year of Local Matters’ Local Foods Week, and we are once again thrilled to be a part of it. To do our part in celebrating all that is tasty and local, Columbus Food Adventures is again offering a special Local Foods Week Tour. This year’s tour features Knead, Latitude 41, That Food Truck, Till, and Brothers Drake Meadery, and – as always – is specially created for Local Foods Week to showcase those restaurants, trucks, and food business that emphasize local and seasonal sourcing. In addition to the tours, we will also be participating in the official kickoff to Local Foods Week at the Hills Market on August 11th. From 10 a.m. to noon, visit us at our table in the market and sample some food inspired by our Alt Eats tour. While you’re there, check out the Grilled Cheese Throwdown, the Kids’ Cookoff, and the Farmers’ Market that will also be taking place. Dinner at Hoover Y – Join local matters for a cookout on Sunday, August 12th from 5pm to 8pm. With food by Two Caterers, ingredients straight from the garden, Barley’s Ale and sangria, this event is sure to be a good time. Food Trucks at Food Fort – Celebrate the grand opening of The Food Fort and the Eddie Grayson Culinary lab with mobile vendors, a DJ and activities for the whole family. The event is August 17th from 5pm to 9pm at ECDI. Crave: Farm to Plate– Enjoy some special farm to plate dishes at over 40 of Columbus’ best restaurants throughout the week. Our partners – Tasi, Rigsby’s, G. Michaels, Deepwood, Barcelona, Skillet, Till and Latitude 41 – are participating, and are sure to not disappoint. 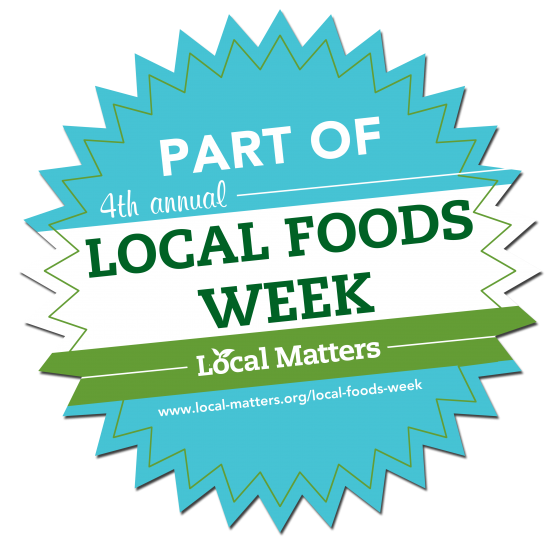 Check out the calendar for information on all Local Foods Week events.